Israel has said little about the apparent air strike on a Syrian weapons store near Latakia but a US official has been much more forthcoming, telling a television network that it was indeed Israel which was the author of the attack. The target, the Americans say, was a missile store holding weaponry that Israel feared was going to be transferred to Hezbollah - the Assad regime's main ally in Lebanon. The attack underscores Israel's determination to hinder such weapons transfers. But the US disclosure - this is not the first time that the Americans have confirmed an Israeli strike - creates at least the potential for some tensions between Israel and Washington. Back in January of this year, Israel struck a weapons convoy that intelligence sources suggest was carrying SA-17 advanced surface-to-air missiles that were to be transferred from Syria to Lebanese militant group Hezbollah. That strike was a warning, an effort to dissuade the regime of President Bashar al-Assad from contemplating any similar transfers to his allies in Lebanon. Since then further attacks have followed: in May on the outskirts of Damascus and in early July near Latakia. Now Israeli aircraft have attacked again in the same area. This series of strikes suggests that this hoped-for deterrent effect has not been achieved. They demonstrate the Israeli Air Force's ability to hit targets well inside Syria, and they could be the first of many - establishing a regular pattern of attacks that at any moment could risk provoking Syria, along with Hezbollah, into a regional war. This is Washington's fear; the nightmare of a major spill-over of the Syria crisis would have become a reality. So what is Israel's concern? While a good share of Israel's and indeed Washington's attention has been taken up by fears of Syria's chemical arsenal falling into the wrong hands, this series of air strikes underscore Israel's equal worry about sophisticated conventional weapons being passed to Hezbollah. This includes sophisticated anti-aircraft missiles, anti-shipping missiles, or accurate long-range ground-to-ground missiles. Such concerns are longstanding. Some four years ago, the then-Israeli government of Prime Minister Ehud Olmert warned that it would not tolerate what it called "game-changing" weapons being transferred to Hezbollah. According to US intelligence sources, the target of Israeli attacks in July was a shipment of ground-to-ground missiles at a warehouse at Damascus airport. The missiles, which had been shipped from Iran, according to the sources, were Fateh-110s - a mobile, highly accurate solid-fuelled missiles with the capability of hitting Israel's main population centres, like Tel Aviv, from southern Lebanon. What was not clear, American officials admit, is exactly who the missiles were intended for - the Syrian army or Hezbollah. But the airport warehouse is said to have been under the control of personnel from Hezbollah and Iran's paramilitary Quds Force. This episode highlighted once again the strong triangular relationship between Tehran, Damascus and Hezbollah. Indeed, recent reports hint at Hezbollah's growing involvement in Syria's civil war with - according to some sources - hundreds of Hezbollah fighters supporting President Assad on the ground. Iran, seeing its Syrian ally on the ropes, is clearly eager to bolster Hezbollah's defences in Lebanon. For his part, President Assad may feel obliged to transfer weaponry to Hezbollah in return for its active assistance. Indeed, the faster the Syrian regime crumbles, the faster the pace of weapons transfers may become. Such transfers have advantages for Mr Assad as well. He may well be playing a longer game. Should his regime lose ground, he might be forced back into the Alawite heartland on the coast, and Hezbollah's military infrastructure in Lebanon would become an even more important ally, with much of Syria lost to him. On the other hand, if Mr Assad survives in Damascus, then a strengthened Hezbollah retains a constant threat of escalating the crisis into a regional conflict - something the US and its allies are desperate to avoid. 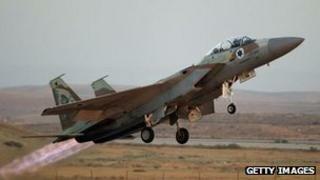 What is even more intriguing is the second of the two Israeli air strikes in early July. The target here was a military complex around Jamraya - an area with headquarters, research facilities and so on. We still do not know the specific target or targets hit, though the flames and explosions would have been visible to many people in Damascus itself. It is perhaps the nature of the target here that contains the real Israeli message to the Syrian president. According to the American source, the target of this latest attack was again missile stocks - possibly SA-17 surface-to-air missiles. This now leaves Mr Assad and his Hezbollah allies in a difficult position. Should they respond in some way? Both see themselves as champions of the resistance against Israel. In the past, Hezbollah has sought to attack Israeli or Jewish targets overseas. Certainly any direct military response from Syria or southern Lebanon risks a much larger confrontation, which both President Assad and the Hezbollah leader Hassan Nasrallah would wish to avoid. Hezbollah is in a difficult position. Its material support for the Assad regime has made it unpopular in both Lebanon and the wider region where it is seen as seeking to aggravate an increasingly sectarian conflict. But Hezbollah seems to have made its strategic decision. The quid pro quo from the Assad regime is clearly the enhancement of Hezbollah's military capabilities. So it is hard to imagine the weapons shipments being halted. Too much is at stake. Depending upon the weather and Israel's intelligence capabilities, some weaponry may still get through. There have been possibly half a dozen air strikes this year and more are likely. The intriguing element in this latest attack is Washington's willingness to point the finger at Israel. Much the same thing happened back in July. Is this a bureaucratic screw-up - somebody talking out of turn - or a deliberate desire on the part of the Obama Administration to make the origin of this attack crystal clear? The US is clearly worried about anything that might be seized upon by the Assad regime to hinder the chemical disarmament process. Israeli air attacks on Syrian targets inevitably complicate matters. Is the American statement intended as a minor warning to the Israelis to back-off ? Some may interpret it in this way. But Washington can be under no illusion. Hezbollah is playing an important role in the Syrian drama. Meanwhile, Hezbollah's missile arsenal remains a potent threat to Israel. There's a message here from Israel to Washington as well. Israel is demonstrating that when it comes to what it perceives as its vital security interests it will act; a message that will come as no surprise to the Americans.